Mabuhay Philippine Cuisine offers more than a dozen traditional Filipino items on its buffet, including fish, chicken, pork and beef. There are a couple of vegetarian dishes as well. 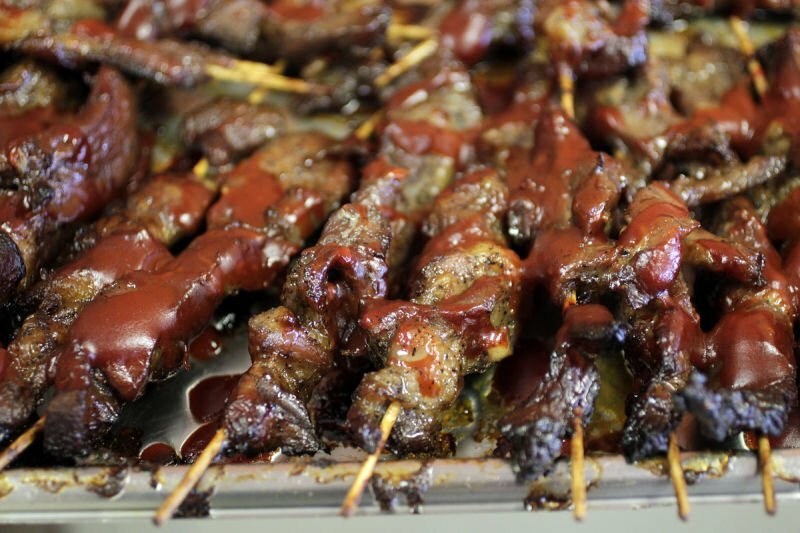 The barbecued pork skewers, were firm, meaty and delicious and offered just the right amount of sauce. The ginataang langka, a traditional Filipino dish with jackfruit, shrimp, ginger, jalapeños and coconut milk has become popular at the new Mabuhay Philippine Cuisine. Mabuhay Philippine Cuisine, Madison’s first Filipino restaurant, opened Jan. 4 in a Park Street strip mall. It replaced the short-lived Colombian restaurant Smiley’s II. The new law mandating that television commercials be no louder than the program they’re interrupting is progress. Now if only there were the same rule for radio. A recent visit to Mabuhay Philippine Cuisine, a new buffet-only Filipino restaurant on Park Street, was marred only by the obnoxious commercials that punctuated the Z104 soundtrack to our lunch. The restaurant could also use some labels on its steam table to identify what is in the various dishes, so we didn’t have to work quite so hard trying to identify the mystery ingredients. The sweet-as-pie owner Farnancita “Cita” Johnson visited our table during dessert and explained some of the items. It was a great education, and we felt so much more informed about what we were eating. 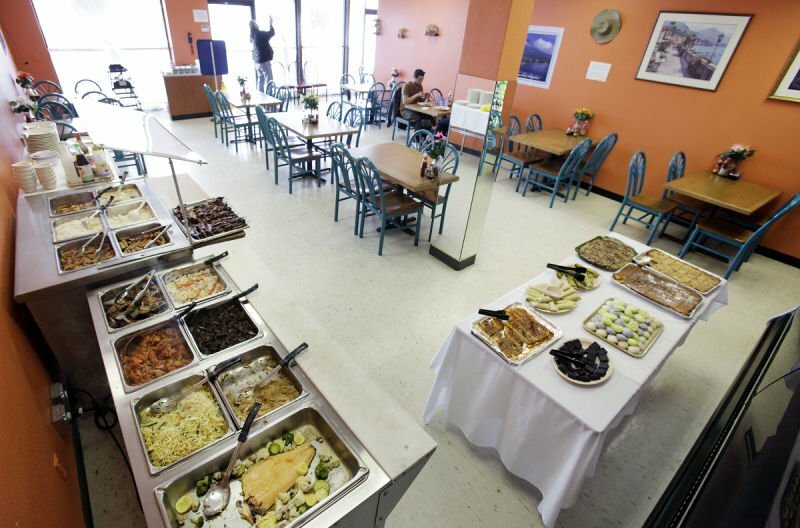 The buffet has about a dozen items, the right amount to be able to try almost everything in small quantities and then go back for anything that inspires seconds. Appetizers proved the weakest link. The only worthwhile ones were the barbecued pork skewers, which were firm, meaty and delicious. The other two were disappointing at best. The lumpia Shanghai, or skinny egg rolls, were basically all flaky, fried wrapper with little inside. Similarly, some little empanada-looking pastries were crumbly, leaden and stale-tasting. Neither was even warm. But oh, the ginataang langka, a mainstay dish involving jackfruit, shrimp, ginger, jalapeños and coconut milk. The jackfruit had a firm, dense texture but the creamy sauce made it resemble pickled herring. “People really like it a lot,” Johnson told me when I interviewed her shortly after the restaurant opened in early January. Because nothing was labeled, we assumed what we were eating was the jackfruit because it was so unfamiliar. “What we’re calling the jackfruit dish is delightful,” my companion said. We were also both struck by a stew with a wonderful orange sauce blanketing large chunks of potato, along with carrots, peas, garbanzo beans, red pepper and pieces of mostly fatty chicken that took some work to be able to eat. In a subsequent phone conversation, Johnson told me it was called apritadang manok — for those who speak Filipino. “This is pretty amazing. No wonder it’s in the back of the warming table,” my companion said, grinning. Also striking was an enormous filet of salmon surrounded by vegetables including zucchini and broccoli. It had the perfect flavor and was cooked just so. One of the more mysterious dishes involved possibly pork, beef and pork rind with red onion and green and orange peppers. I was glad I took a small portion. On the plus side was a vegetarian dish with eggplant, squash and okra. Johnson said there are always two soups and two noodle dishes. One of the soups had a great flavored broth, but the vegetables weren’t cut small enough. OK, they were mammoth. There were even slices of corn on the cob, sliced horizontally through the cob. I enjoyed both noodle dishes, one with ramen noodles, the other with vermicelli. However, a shrimp in the latter dish had to be peeled. And after all that effort, it was mealy, probably from sitting in a warming tray too long. While an eggy dish had onion and tomato and was nicely seasoned, it also contained some bizarre green vegetable/fruit that both my companion and I had to spit out. It was both bland and bitter, my friend observed. “Is that even possible?” he asked. Later, Johnson would tell me that it is a Philippine fruit called “bitter melon.” And she was not surprised we had an adverse reaction to it. Filipinos apparently love it. The dessert table is so extensive it looks like a bake sale. Almost everything we sampled was outstanding, particularly the leche flan. Also make sure to try anything with purple yam. Not everything here works, but once you find what you like, it is easy to make a great and exotic meal. Johnson told me the word Mabuhay means welcome, something you hear when you land at the Manila airport. It also means “hip hip hooray,” she said. In other words, something you’ll say after you dine at this Park Street gem. Location: 1272 S. Park St. Hours: Monday through Friday from 10:30 a.m. to 9 p.m.; Saturday 8 a.m. to 9 p.m.; and Sunday 8 a.m. to 5 p.m.
Prices: The cost of the buffet is $7.99 at lunchtime; $8.99 at dinner and brunch. There are discounts for children and seniors. Gluten-free: Many naturally gluten-free offerings. Bottom line: This Filipino restaurant, the city’s first, is buffet only. Th ere is no regular menu. While that means that not everything is exactly hot and fresh, it does offer variety and convenient quickness, particularly at lunchtime. And the price can’t be beat. Not a lot for vegetarians or children.